I want to point out a new Sunday School curriculum that is free to download and use in your church. The Praise Factory family of curriculum is the creation of Connie Dever, wife of Mark Dever, senior pastor of Capitol Hill Baptist Church, Washington, DC. You may have heard of Mark Dever from his book and ministry that share the name 9 Marks. If you are looking for a 9 Marks Sunday School curriculum for children, this is as close as you’ll find. This will be a great resource for hundreds of church who want biblical lesson plans for Sunday school that will challenge kids to grow in their understanding and love for God. From what I’ve seen these are very God-centered Sunday school lessons that use good educational practice. 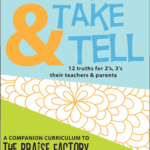 If anyone has used the Praise Factory Sunday School Curriculum, leave a comment below and share your thoughts. Tony Kummer (Editor) reviewed & updated this page on : August 31, 2017 at 12:47 pm. All our content is peer reviewed by our readers, simply leave a comment on any post suggest an update.